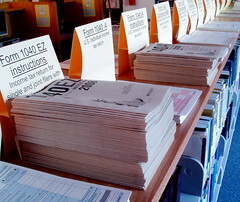 Next Monday, June 15, is the deadline for filing second quarter estimated taxes with the IRS. If you are self-employed and so do not have taxes withheld from a paycheck, you need to discover if the IRS expects you to pay tax in quarterly installments. I didn’t calculate my estimated taxes for the first quarter of this year, either. Between January and March I had received only a couple thousand dollars’ income, which extrapolated over the year put me at maybe $10-12K, which I figured was too small to matter. In hindsight, I probably should have filed for the first quarter on April 15; retroactive calculations remind me that even if you are too poor to owe any federal income tax, you still have to pay self-employment. With $12,000 of income I would owe about $1400 in self-employment tax for the year, or $350 per quarter. Small oops. By the end of May things had ramped up for me; my main client was paying very promptly and giving me steady work, plus I’d gotten a few windfalls and nibbles on other projects. I’d already passed the $10K mark and could reasonably expect to keep going at something like the current rate. So … time to break out the IRS forms. I’m pleased to report that the calculations weren’t nearly as agonizing as I feared; running a back-of-the-envelope style estimate took me less than half an hour. I’ve put together a plain-English step-by-step guide (with links out to the relevant IRS information) which should help speed you along. I can’t cover every contingency in a quick guide, but this should work well for all but a tiny percentage of people. At minimum you need a pen and IRS Form 1040-SE. A calculator or spreadsheet is recommended for speed and accuracy. If an amount corresponds to a particular line number in Form 1040-SE, it’s noted in parentheses. I’ve labeled my lines with letters to avoid confusion with 1040-SE’s numbers. So for example, ‘LINE C (11)’ is the third calculation you will make, and corresponds to line 11 on 1040-SE. LINE A: Estimate annual gross income. If you’re estimating taxes right now for the first time this year, add up what you’ve received so far and double it. Adjust for any irregularities you know to expect, but don’t agonize over it too much — this is an estimate, and you can always change it next quarter. Just be as realistic as possible. LINE B: Determine whether you have major deductible expenses. I decided to be conservative and NOT factor in deductible business expenses, even though I will undoubtedly have a few. I have a home office, but it’s small and shared with my partner. At this point I’m not planning on anything major (like a new computer) so I expect my business-related expenses to be minimal, maybe one or two hundred dollars at most. If you’re an old hat at Schedule C and know you’ll have significant deductions, factor them into your estimate. If you’re new to self-employment, you might prefer not to worry about calculating deductions at this point. The worst that can happen is that you overpay slightly and will get a refund when you file for the year. If you need it, the IRS has information about deductible business expenses. Home offices get their own publication. LINE C (11): Calculate self-employment tax. LINE D (1): Factor ‘Expected AGI (Adjusted Gross Income)’. If all of your income this year is from self-employment (no salaried wages or social security benefits), this simply means subtract 1/2 of C from A. If your situation is more complex, see the instructions for calculating AGI. LINE E (2): Decide whether to calculate with a standard deduction or an itemized estimate. I’ve been itemizing my taxes every year since we bought the house because of the mortgage interest tax break. However, I strongly suspect that in 2009 it will be more advantageous for Jak to claim the mortgage interest and other itemized deductions while I stick to the standard deduction. If I’m wrong, I’ll owe less in taxes later than I expect now, so no harm done — better than going the other way and incurring a penalty for underpayment. Standard 2009 deductions are: $5,700 for single or married filing separately, $8,350 for head of household, $11,400 for married filing jointly. LINE F (3): Subtract your deductions. LINE G (4): Add up your personal exemptions. For unmarried folk like myself with no claimable dependents (stepkids don’t count! ), that’s one exemption at $3,650. Add another $3,650 for your spouse if married-filing-jointly, and one for each qualified dependent. The IRS has instructions for determining exemptions and qualified dependents if you’re not certain. LINE H (5): Subtract your exemptions. LINE I (6): Calculate federal tax. This one you’re going to have to look up in a table, but take heart — the tables are short and the calculation simple. The rate schedules on Wikipedia are accurate for 2009, or you can grab them from the IRS 1040-ES PDF. In my case, this meant subtracting $8,350 from H, multiplying by .15, and adding $835. LINE J (13): Add federal and self-employment taxes. The Earned Income Credit is a small break for underemployed persons, mostly those with children. For 2009, if you’re single with no qualifying children and your AGI (Line D) is more than $13,440, you’re ineligible. Subtract 0 from J and move to Line L.
If you think you might qualify, consult the income thresholds and credits chart for the 2009 EITC (scroll to the bottom of the page). Subtract the corresponding dollar amount from J. LINE L (14): Multiply estimated taxes by 90%. Multiply K by .9. If the result is less than $1000, stop now — you don’t owe estimated tax. LINE M: Calculate quarterly estimated tax payment. If you’re making the standard four payments, divide L by 4. If, like me, you skipped or missed the first quarter (due April 15), you might want to divide by 2 (and pay half, quarter, quarter). And that’s it. Write your check to ‘United States Treasury’, print the coupon from the 1040-ES form, and mail both to your regional IRS clearinghouse (addresses are on page 6 of the 1040-ES). Good job! Interesting that your writer recommends not using the form but simply going from last year’s taxes. Makes sense if you’re freelancing year after year. I didn’t do this because I was salaried through almost all of 2008, with a significantly higher gross income for the year, so I expected my total taxes to be lower this year. I don’t want to substantially overpay for 2009! But I just checked my total taxes for 2008, and to my surprise (and chagrin) it was actually a couple hundred dollars less than my estimate for 2009! Part of that is the mortgage deduction which I suspect my partner will take this year, so I didn’t factor it in; the rest is those nasty self-employment taxes. Boo. So maybe I did it the hard way unnecessarily! I’m still glad to have the comparative numbers, though.